9 January 2019 (FAO)* — Mongolians and their livestock have lived on the steppe for centuries. And although the steppe may seem like vast and open land, more than 60 million animals graze on its pasture. 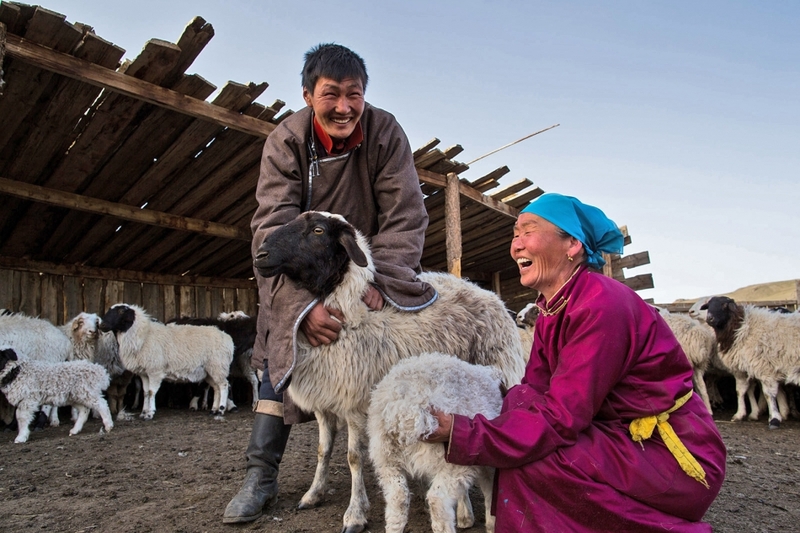 Raising livestock is the most important livelihood in Mongolia – and is the sole source of income for 35 percent of households. The life of a livestock herder defies the challenges brought by Mongolia’s climate – summers are very hot and dry and winters bitterly cold. And over the past two decades, climate change has made a phenomenon known as a dzud, a very harsh winter preceded by a hot, dry summer, more severe and more frequent. During a dzud the ground is frozen solid under deep snow, meaning that livestock cannot reach any pasture. Poor grazing during the summer months has not allowed the animals to build up the storage of fat they need for winter and consequently, large numbers of livestock die from either starvation or cold. When natural sources of food are scarce, livestock herders end up needing to buy extra fodder to keep their livestock fed. If they cannot afford the extra food, these livestock herders then find themselves facing financial ruin in the space of just one season. 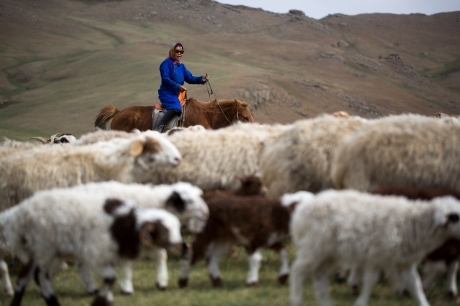 When herders’ livelihoods are devastated by the cumulative effects of the dzuds, and by the high-interest loans they take out to survive, many move to the cities. Already destitute, they live in yurts on the outskirts, devoid of working infrastructure, and unable to break out of the poverty cycle. In the last two years, FAO has implemented four emergency programmes in response to severe dzuds to try to mitigate the devastating impact on the poorest herders. FAO has brought an in-depth understanding of the country to the interventions as well as the experience of livestock programmes and hands-on skills in implementation. Protecting lives and livelihoods means deeply understanding local complexities and challenges. A loan from two years ago was still hanging over the head of Anabish Jamransuren and his family when they had to start thinking about how they were going to get through the next dzud. They have now managed to pay off their loan as a result of FAO’s Early Warning Early Action programme. Herder households like the Anabish family who kept goats for their cashmere were among those given feed and nutritional supplements before the worst of the extreme winter weather. The extra help enabled them to keep their livestock healthy, and as a result, comb their goats for cashmere in the spring when prices are highest. “Without this support, we would have had to buy more food for our animals with an advance, set against the money we hoped to earn from our cashmere production. These loans are a huge burden and I have been spared another one,” Anabish says. He bought 100 bales of hay in preparation for the expected harsh winter and is currently planning to buy double that amount next year – without going into debt. Shaariibuu Luttumur, too, was worried about debt. “I would have had to have taken another loan just to get us all through the winter. I fear what would have happened if I didn’t get the help I needed,” he recalls. Luckily, Shaariibuu received timely assistance from FAO in the form of 846 kg of concentrated feed. He also received a cash payment for selling a sheep and a goat as part of the destocking programme. The combined efforts allowed him to continue caring for his animals when his stocks ran out. For Chimeddavaa Lodon, it has been an investment for the future for the whole family. Because of FAO intervention in Mongolia, Chimeddavaa’s daughter will be able to graduate from high school. Chimeddavaa had been worried as the harsh winter took hold and the 300 bales of hay she had bought with a loan against her mother’s pension had run out. So had the fodder for the family’s 55 sheep, 50 goats and 23 cows. The concentrated feed and nutritional supplements such as fish oil and mineral blocks from FAO’s programme came at just the right time, as the core breeding animals were getting ready to give birth. “With the help provided by FAO, I was able to save my weak animals. They are key to the money and the milk available for the three generations of our family – my mother, myself and my daughter,” says Chimeddavaa. Thanks to these early actions, for every USD 1 FAO spent, herders saw benefits of USD 7.1 per household in avoided losses and added benefits. Less animals died, fewer became sick and thin, cashmere was sold at the right time, and the milk that sustains many families kept flowing. Working with national governments and humanitarian, development and scientific partners, FAO’s Early Warning Early Action approach monitors risk information systems and translates warnings into anticipatory actions. FAO hopes that it can help poor and vulnerable people maintain their self-confidence, dignity and above all, their humanity to face future challenges. Acting early saves lives and livelihoods, builds resilience to future shocks, eases pressure on strained humanitarian resources and brings us closer to #ZeroHunger.